Mother Nature is once again doing all she can to prevent us from having a great 2006 racing season. Many tracks have had several rain outs or rain shorted events this season. We need to remember to thank all the tracks for all they do to keep local racing alive here in Michigan. There are so many great racing facilities that have closed up do to high insurance rates, pressure from home owners who build right next to a speedway, along with many other concerns that make it hard to keep the doors open. I myself am asking that all of our members take the time to say THANK YOU to all of our membership tracks and those who are not members of our club also. It is up to us to help keep local racing alive not only here in Michigan but across the country. As always and questions of comments are welcome at president@marfc.org. AUTO CITY SPEEDWAY: Mother Nature won this round. Big thank you goes out to Joe DeWitte a crew for rescheduling our event for August 5, 2006. Mother Nature tired again to win but the folks at the speedway pushed forward and racing went on as scheduled. It was again autograph night at Toledo as fans and members were able to go out onto the track and meet all the drivers up close. 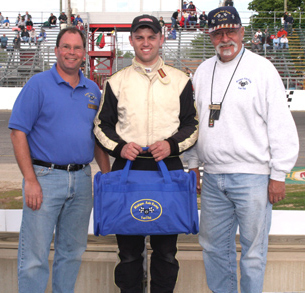 Factory Stock # 11 driver Dave Golembiewski a.k.a “GUMBIE” was chosen to receive our MARFC/Uniform Helmet Bag for being the current point’s leader and also being in the top five in points for the past five years. To Roy Mott, Ron Drager and all the staff at Toledo we say Thank you for having us and we look forward to being back again later in September.